The church bells began ringing at twelve noon and continued for ten minutes. It was the National Day of Prayer–September 14, 2001. Everyone was focused on the death and destruction of September 11, praying both for the victims and the survivors, and looking for a ray of hope in that dark time. To find that ray, we in Pennsylvania only had to turn off our televisions and radios and go outside into the radiance of a perfect September day. As we drove up our hollow road in mid-afternoon, sunlight streamed through the trees in cathedral-like splendor, lifting my spirits. Suddenly we encountered a raptor-sized bird sitting in the middle of the road. My husband Bruce drove to within fifteen feet of it before it flew briefly on to the muddy road bank, clawed its way up it, and then flew to a low branch overhanging the road to pick at whatever small insect it had caught and grasped with its feet. Even without binoculars we could tell the bird was a falcon that was larger than an American kestrel and smaller than a peregrine falcon. It had a faint “moustache” mark on its face, bluish-gray black, squared-off, white-edged tail, and reddish-brown speckled breast, in short, all the field marks of the taiga form of an adult male merlin. Bruce turned off the engine and he and I and our son Dave watched what seemed to be an almost tame bird. At first we thought he was hurt as he fluttered down into the road ditch and walked for a short distance, hunting on foot as sharp-shinned hawks sometimes do. But he was capable of short bursts of flight. Autumn weather had arrived the previous evening, following a storm, and the clear, cool, windy day was perfect for raptor migration. Moreover, the birds had had the sky to themselves, something they have not experienced since the invention of the airplane nearly a century ago. I wondered if they had noticed the difference? Our merlin had probably soared on the thermals for most of the day and had then dropped into our sheltered hollow to look for food and refuge for the night. Formerly known as “pigeon hawks” because their flight resembles that of pigeons, merlins prey mostly on small birds, hunting them from perches, but also by flying rapidly below the treetops or even close to the ground as this one was doing. They also eat insects, particularly dragonflies, during migration. No doubt our merlin was hoping to catch small birds in our hollow, but he was willing to substitute insects, small mammals, and even reptiles. We continued to watch him for ten minutes as he cruised low back and forth across the road. Then he flew up higher on to a tree branch which assured us that he was not injured. Slowly Bruce drove on, but the merlin persisted in flying low ahead of us and landing briefly on tree branches on either side of the car. Apparently he was hoping that we would flush prey for him since merlins are known to attack prey flushed by both living creatures, such as northern harriers, and non-living objects, particularly cars. In fact, merlins are opportunistic hunters that hunt with other species such as sharp-shinned hawks, eat carrion, prey on nestling birds, and hunt bats at cave openings. B. H. Warren, State Ornithologist for Pennsylvania at the end of the nineteenth century wrote in his book BIRDS OF PENNSYLVANIA: “Two Pigeon hawks during the late fall lurked about the southern suburbs of the borough of West Chester, preying at regular intervals on the pigeons of a blacksmith. In one week the hawks killed or drove away fifty of the birds. The hawks would enter the boxes and take from them the pigeons.” So perhaps the old name, pigeon hawk, is apt in more ways than one. Finally, our merlin flew across the stream and disappeared in our leafy forest, probably to resume the hunting we had interrupted. That male was no doubt enroute to his wintering grounds in coastal Florida, the Greater Antilles, or Central or South America. Some merlins even migrate as far south as northern Peru. But a few go no farther than the Schenley Park Golf Course, “a nine hole course in Pittsburgh’s Oakland section, not far from the main campus of the University of Pittsburgh,” according to Jack E. Solomon, a member of the Three Rivers Birding Club. “Once I watched a merlin eat a starling-sized bird about 40 or 60 feet away,” he told me. The club’s Bird Reporting Editor, Mike Fialkovich, says that the merlin roost at the golf course was first discovered on November 23, 1997 by birder Bill HIntze who reported the birds to him. “The birds are seen at dusk perched on various trees planted… on the golf course. Then they fly into the pines planted on the golf course for the night. I have found droppings and pellets under some of the pine trees”—an indication of where they spend the night. Shortly after dawn they disappear for the day, and no one is certain where they go although through the years merlins have been seen as close as Homewood Cemetery, three miles from the golf course, or in Schenley Park itself, or as far away as 20 miles in Natrona Heights. But no one knows whether these distant birds are the golf course merlins. When they were first discovered, there were five of them. Since then, their numbers have fluctuated from two to four. Usually they begin arriving in October and leave by late March or early April. Last winter there were three merlins and, as usual, they provided plenty of entertainment for birders. But the merlin capital of North America, both in winter and summer, is Saskatoon, Saskatchewan, far to the north and west of Pittsburgh. According to merlin researcher Lynn W. Oliphant, who lives in Saskatoon, as of 1997 thirty pairs of merlins nested in the city, “forming the densest nesting population of merlins known,” he writes in HAWK MOUNTAIN NEWS. But between 18 and 31 merlins also winter there and in other northern prairie cities that have an abundant prey base of house sparrows and Bohemian waxwings. The Saskatoon merlins are a different subspecies than our taiga merlin (Falco columbarius columbarius) of the boreal forest. That subspecies, the prairie merlin (F.c. richardsonii), is the one that researchers have studied the most. The third subspecies in North America is the black merlin (F.c. suckleyi) of the Pacific Northwest. The merlin is a circumboreal species and during the Middle Ages in Europe was known as a “lady’s hawk” in falconry. Both Catherine the Great of Russia and Mary Queen of Scots flew merlins at skylarks, and today a few falconers in our country use them to fly at a variety of small birds. Merlin numbers seem to be increasing. Lately they have extended their breeding range as far south as northern New York and New England. Taiga merlins prefer to nest near forested openings, in fragmented woodlots, and on or near water. These monogamous raptors are especially renown for their spectacular courtship displays–diving, rocking, circling, and soaring and finally bowing and fanning their tails before copulating. They use old crow or hawk nests and the female lays between four and six eggs. Both sexes incubate the eggs although the male is only on the nest between seven and 15 percent of the time. Mostly he hunts for himself and his mate, bringing her an average of three birds a day. After about 30 days, the eggs hatch and while the female broods the young for another seven days, the male continues to supply food for her and the nestlings. He flies into the area calling and the female meets him a distance from the nest. She takes the food from him which she then feeds to the chicks. Sometimes females don’t hunt until their young fledge at 29 days of age. Others start hunting when the nestlings are three weeks old. In the meantime, not only does the male supply his family with 9.6 birds a day, but he does much of the nest defense, especially from crows. After the fledglings leave the nest they remain dependent on their parents for between one and four weeks while they learn to hunt for themselves, often practicing on dragonflies. Then, in early August, merlins begin moving south, the females usually ahead of the males. Sometime in mid to late August the first merlin zips past Hawk Mountain. Over the decades the long-term average of merlins seen there each fall was 33. Lately, though, the numbers have increased spectacularly. The record was 168 in 1995 and matched in 2000. But last year 176 merlins broke the sanctuary record. The increase is probably due to the merlins’ breeding range expansion into northern New England. Closer to our home, the Stone Mountain Hawkwatch recorded 36 merlins last fall, their second all-time high after the 51 they recorded in 2000. Peak migration for merlins is between mid-August and late October. And there is nothing more exciting for hawkwatchers than the sight of a merlin diving repeatedly at an owl decoy. 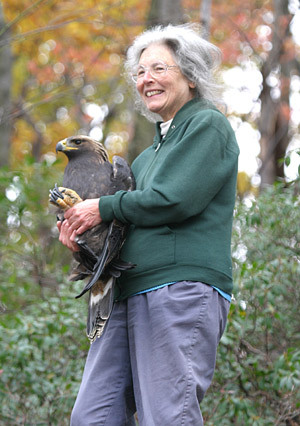 One dived 13 times at Hawk Mountain’s decoy, Senior Naturalist Laurie Goodrich reported. But on the National Day of Prayer, that special day of remembrance, we felt as if our merlin’s visitation had consecrated our green cathedral and bestowed a blessing on us that we will cherish for many years.